Yes, I do know that in some places they are invasive. It’s the same as you said here too though — I haven’t seen any ‘extras’ growing around in the woods and I’ve had these shrubs for many years. I love them. I thought about you during that snowstorm! I can’t imagine having snow like that, much less that early in the year. Yes, there’s always next year to look forward to! 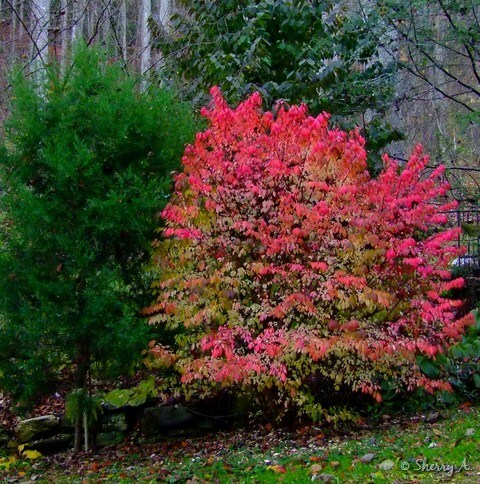 Beautiful color on the burning bush. Although we have plunged into the 40’s at night here in the desert, there is no fall color here. What kinds of bulbs are you going to be planting? 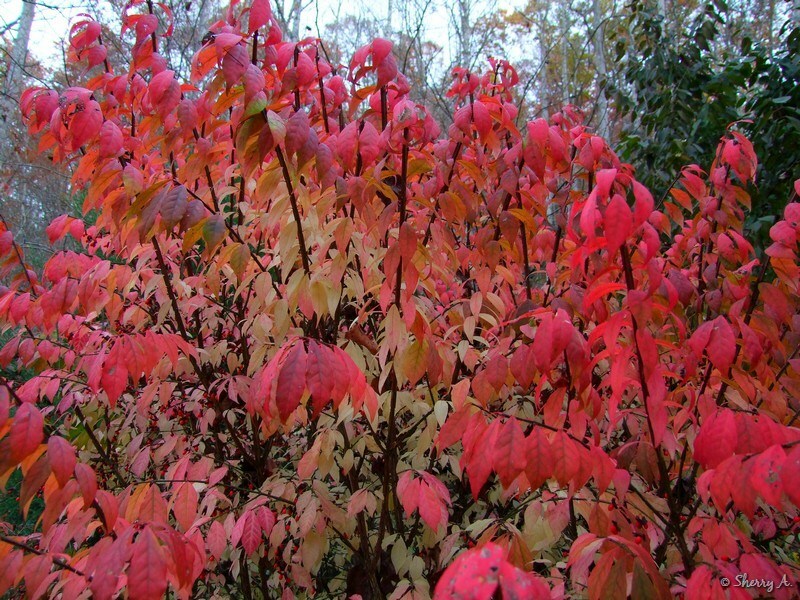 Our fall color is just about finished now and I hate seeing the bare gray trees in the woods. Spring can’t come soon enough for me. This year I’m planting mostly alliums, two or three different types, and a few daffodils, and about a dozen Darwin tulips. Alliums are what I have the most of though, they do well here and I don’t have to worry about the devil squirrels digging up the bulbs all fall and winter. Oh my. Gorgeous. My Mom has a couple of these but they are not that large. I just love the deep red they turn. They do turn the most gorgeous shade of red don’t they? I love them too! A happy new year to you and yours, Sherry. Thank you, Christine. I wish you and your family a very happy new year.